One of these things ought to be familiar, but the other one may not be (they are shown to scale here). The first commenter to correctly identify them both wins 100 SV-POW!bucks (TM), which aren’t worth diddly in the real world* but can be exchanged for worship, admiration, and bragging rights on teh intert00bz. The contest will run until someone gets the right answer or the week is out. All will be revealed next week. Mike and Darren are forbidden to compete, not because it would be unfair but because I don’t like them very much. This isn’t an impossible task, by the way. The info is out there. The only question is whether you are lonely geeky awesome enough to solve the mystery. * That’s just a guess. It’s possible that at SVP you might find someone who would you buy you a beer in exchange for some SV-POW!bucks (TM), or just because you have more than them. Biggie is Sauroposeidon and I would guess the smaller one belongs to Giraffatitan(=Brachiosaurus). Another alternative (albeit slightly less likely) is that they belong to somebody with a really, really long neck. Seriously though, I’m absolutely blown away at how huge Sauroposeidon’s cervicals are. Me too! And I’ve had longer to get used to the idea than anyone. But when I stop to think about just how big they are, and what they’re made of–or rather, not made of–I’m still absolutely gobsmacked. Which probably has a lot to do with why, more than a decade on, I’m more interested than ever in sauropods, long necks, and pneumaticity. That specimen has cast a LONG shadow over me. But enough about big S. Who’s the little friend, do you reckon? 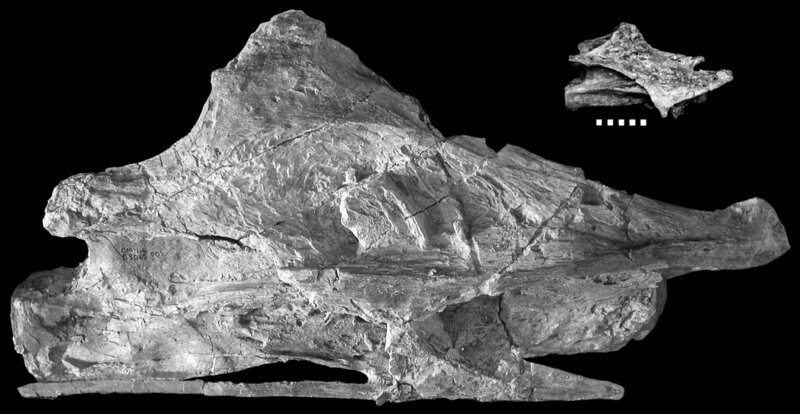 Sauroposeidon and a cervical referred to Malawisaurus? You are famous on Wikipedia! I notice that Darren Naish has a comprehensive entry on Wikipedia (that nonetheless fails to note the clear favor in which he is held as the natural successor and heir apparent to David Attenborough), but that Matt’s name, in the Sauroposeidon page, links to what can only called a nascent, inchoate, unrealized article. How about Europasaurus for the little guy? The big one is a Sauroposeidon cervical, and the small one may be from Europasaurus or some other smaller Brachiosauridae. I’m going to go with Sauroposeidon for the big one, and hazard a guess at Magyarosaurus for the little one. The big one is most certainly Sauroposeidon. I’m not sure about the little dude. The little one looks at first glance to be a brachiosaur, but it’s NOT Giraffatitan. It’s too small for that. If it were Europasaurus, there’s only one cervical it could possibly be (the lower one that was found). It seems a BIT too large for Europasaurus but only a bit. Its crumbly appearance looks like a Wealden sauropod, but those are usually HUGE… I don’t deny the possibility that it could be and upper cervical from Barosaurus or some other diplodocid though the low hanging side arch makes that unlikely given the last time I guessed correctly…. It doesn’t look like a titanosaur, but I’m a bit murky on those…. It certainly has a “Jurassic” appearance to it. Nima, It’s definitely not Europasaurus — the preservation is not good enough, and the shape is, well, hard to explain but too blocky. The small vert looks like a drawing of an idealised brachiosaur cervical done by a bright but not particularly observant child, whereas the Europasaurus cervicals are much more elegant and, if you follow me, Ferarri-like. The Large one belong clearly to Sauroposeidon….and the small one belong to a croatian sauropod described in 1998 by Fabio ‘Carniadactylus’ Dalla Vecchia as a possible ‘brachiosaurid’…..and his name is….WN-V1!